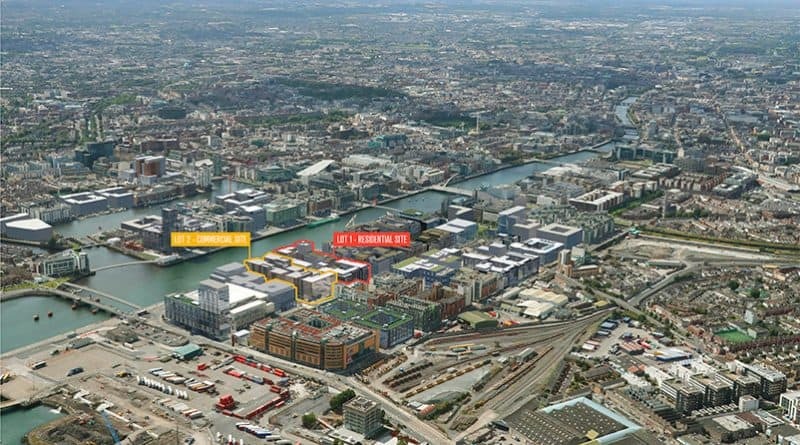 A site extending to approximately 4.60 acres in the heart of Dublin’s busy docklands area has been placed on the market for sale with a guide price of €120,000,000 on the instruction of David Carson, statutory receiver. Savills and Cushman & Wakefield, as joint selling agents are pleased to present Project Waterfront, a rare opportunity to acquire two adjacent significant sites boasting a waterfront location in the Docklands with planning permission. 1) Lot 1 The Residential Site – with planning permission for a scheme comprising two residential buildings ranging in height from 6 storeys to 11 storeys, accommodating 420 apartments comprising 1, 2 and 3-bed units. A crèche, café / restaurant and retail element is also provided for in the planning. 2) Lot 2 The Commercial Site – with planning permission for four no. office buildings ranging in height from 6 storeys to 8 storeys and a total net office area of approx. 27,891 sq.m. (300,216 sq.ft). Feasibility studies which have been carried out suggest that the revision of the apartment guidelines announced recently could push the residential densities between 494 and 526 units, depending on mix and layouts. The commercial scheme was granted a ten year planning permission in December 2017, while the residential scheme has a five year permission, also granted in December 2017. According to the agents, the finished residential scheme will be well positioned to benefit from the huge weight of equity seeking PRS (private rented sector) stock at aggressive yields in Dublin while the office scheme provides an opportunity for a prestigious Waterfront HQ. In terms of an office location, Dublin Docklands have undergone a dramatic transformation in recent years, with the ongoing development of ‘Dublin Landings’ to the west of the site and ‘The Point Village’ student accommodation building – which is scheduled for completion in September – to the north. Furthermore, an office development known as North Dock 1 – 2 and an aparthotel scheme are being developed at 91-94 North Wall Quay adjoining the property to the east. The heightened development activity has enhanced the popularity of this area which is now considered a premium business address. A recent analysis on the Dublin office market suggests that demand for office space has reached a post-recession high of 4.1 million square feet (up from 3.5m sq. ft. pre-Brexit vote). 89% of this demand is focused on the core CBD area. Dublin Docklands is hugely popular with residents due to its central location with some of the best amenities and facilities the city has to offer on its doorstep and the units have been designed to optimise the views over the River Liffey and the Dublin Skyline. Project Waterfront is well-serviced by public transport with ‘The Point’ Luas stop situated within 50m of the site on Mayor Street Upper. In addition, Dublin Bus, the Aircoach and Dublin Bike have all terminus adjacent to the site on North Wall Quay while both the Docklands Rail Station and Connolly Station are located within a short walk.